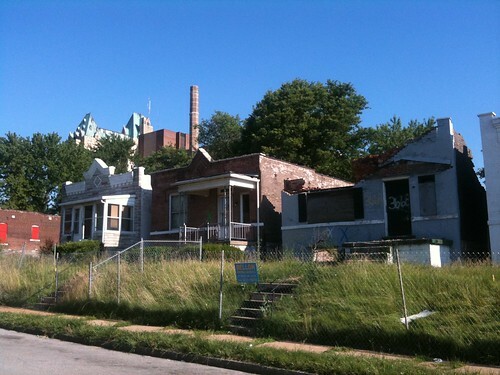 Several weeks ago a friend tipped me off that St. Louis University Medical Center was in the process of demolishing houses on the 36xx blocks of Hickory and Rutger. 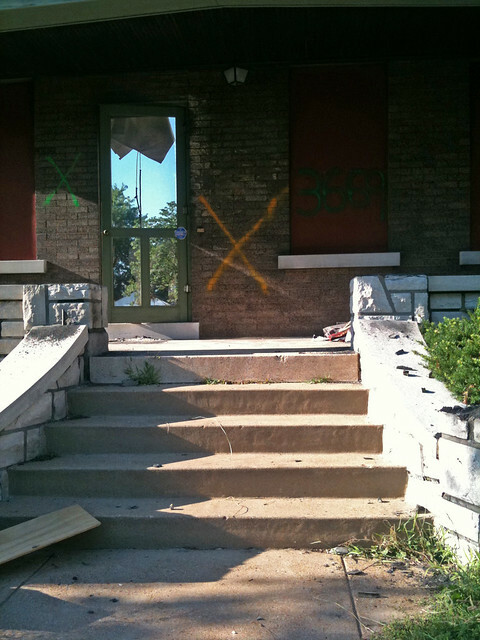 He had correctly predicted several years ago that the isolated little neighborhood of houses, immediately north of SLU's main hospital towers, would eventually meet their demise. 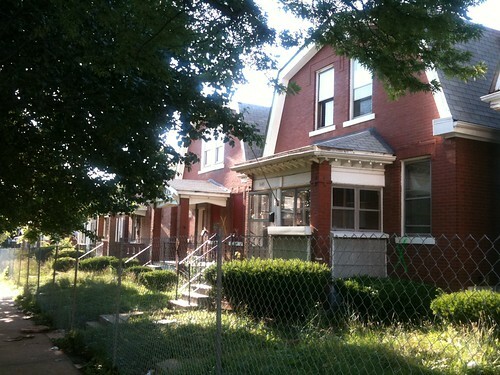 The small homes on both blocks appeared to have been well kept. 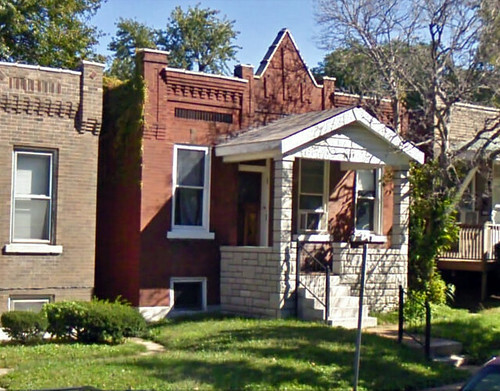 They were mostly one story all brick single family homes. When I arrived to photograph, several were already gone and several more were in the process of demolition. 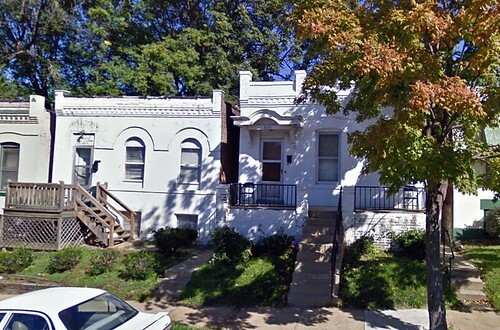 These three buildings on Hickory were two-families with side by side shotgun style units. 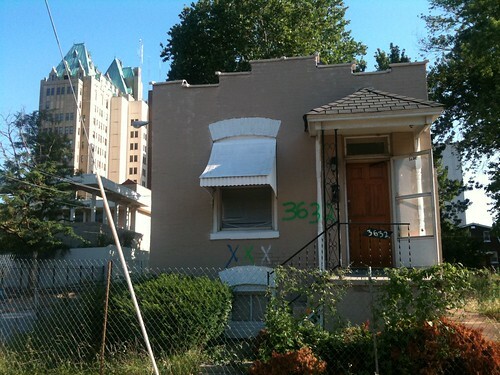 One of the smallest homes on Hickory with SLU looming large in the background. 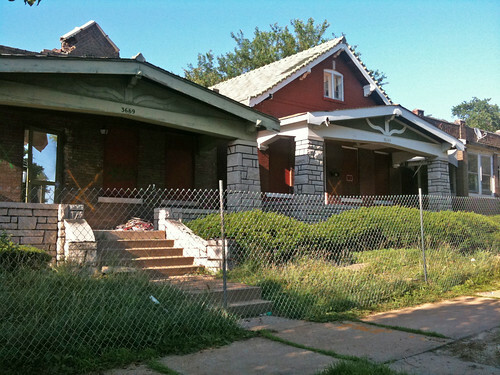 These homes on the north side of Hickory are among 10 that are still in private ownership. The tap destroys are for the houses on the south side of the street. I spoke briefly with a woman who live in one of the houses and owns another one as a rental. She said she had not yet been approached about being bought out. She said she likes living there, and prefers not to move because the location is very good. 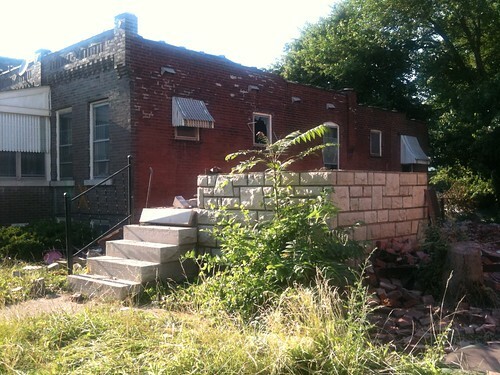 SLU has purchased and is demolishing four houses on this side of the street though, so it is likely only a matter of time until they take the whole block. Two houses in the middle of the north side of Hickory that are being demolished and a Google Streetview of what they looked like as of a few months ago. 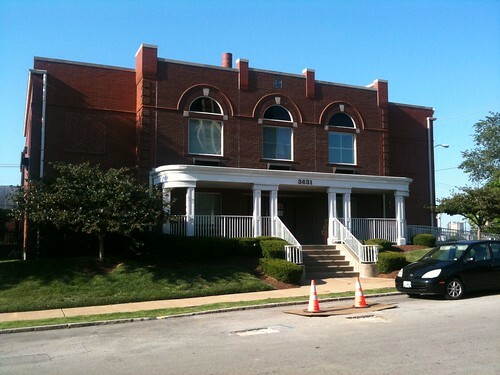 At the end of the north side of Hickory near Grand is a lodging facility for families of people in the hospital. Ironically the architect chose to take cues from the context that is now being destroyed around it. Over on Rutger there were two houses that had been remodeled in the bungalow style, with one expanded with a second floor, probably sometime in the 1920's. 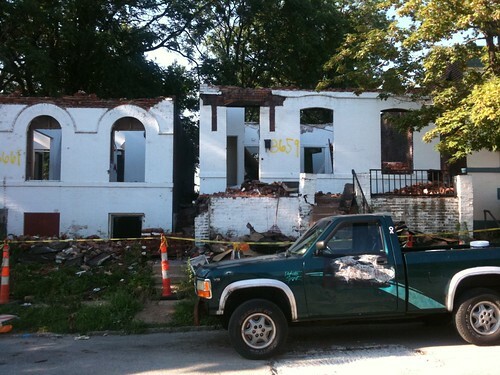 Only the front wall and porch were left of the one story bungalow. Just west of the bungalows only a stone porch of the home in the Streetview shot above remains. The brick work on many of these small houses was beautiful. At the east end of Rutger there was a row of several two story Dutch Colonials. 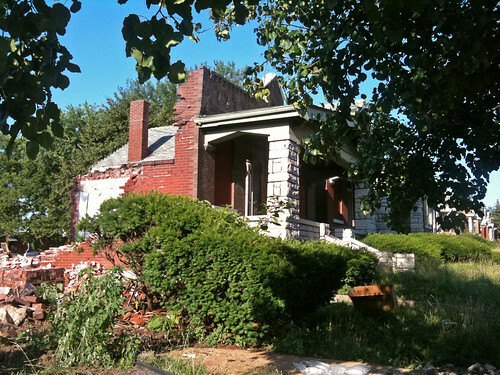 They were the largest homes in the area and like the smaller ones, all in great shape. 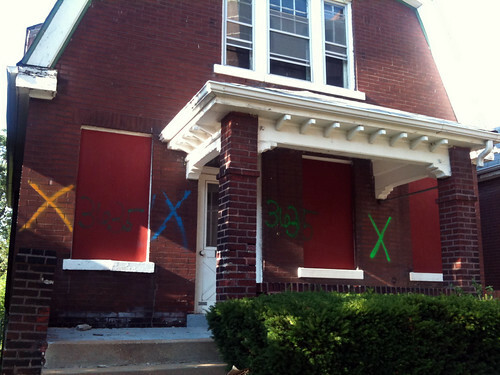 Looking like the scene from some natural disaster, most of the homes had large X's spray painted on them. I am guessing the colors represent that each utility has been cut off from the house. The small neighborhood has always been isolated. 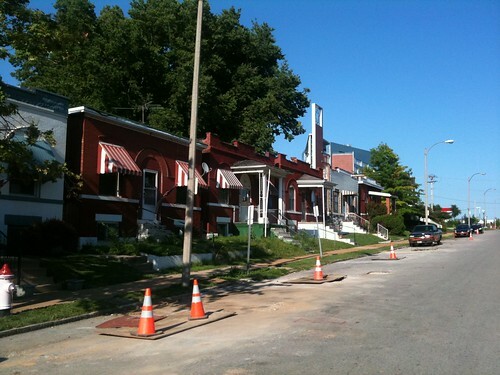 Many of the houses had been there since before almost anything that exists in the area today, including St. Louis University Hospital, which did not open until 1933. In 1909, according to the Sanborn map above, the present hospital site between Rutger and Vista contained some small houses along Rutger, the Bethesda Incurables Hospital and some larger residences on Grand Boulevard. 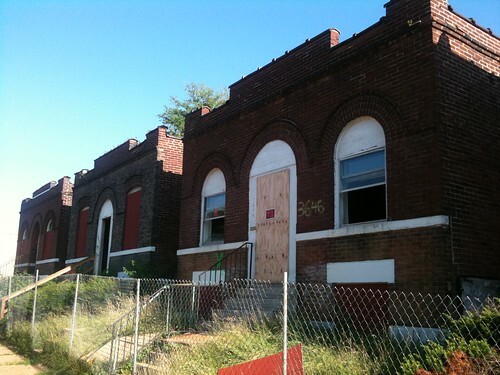 South of Vista, the only building that existed was the United Railways Employees Hall, which appeared to have been added to the rear of a large home on Grand. The massive United Railways streetcar complex was located just west of Spring Avenue. Even the Pevely Dairy site is labeled as a quarry on this map. Amid the mix of commercial, institutional and industrial uses, a large concentration of residential only began south of Park Avenue. 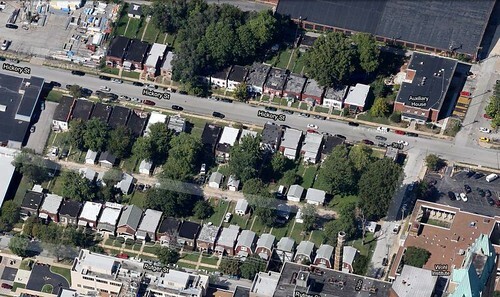 Thus these few blocks of homes on Hickory and Rutger were likely doomed from the very beginning. Still a sad loss, even in an isolated and forgotten corner of the city. SLU pretty much has carte blanche in between the interstates. Oh, how I haaaaaate SLU. so should we expect any kind of building here or just more parking? Good question Adam. I meant to comment on that, but ran out of time this morning. I tried a search about SLU expanding their hospital facilities and did not find anything that is immediate in terms of new building. I'm sure they have a 10 year master plan just like BJC does, but as we have see w/ SLU before, they have no problem simply tearing down buildings and letting the land sit empty for years. if someone knows more, please comment. Biondi strikes again! I wonder how livid he is that Yackey claims to be investigating possible reuse of the Saucer. Or how hard he's trying to convince Yackey to demolish. SLU is after all a world-class university with no room for any buildings from between 1930 and 1990! It's a shame those beautiful homes got torn down. They are historic and each and everyone of them holds a story or two about St Louos. I think it looks amazing. I'm not sure I would have had the patience that you had though! Just saw your website. Thanks for taking the pictures! 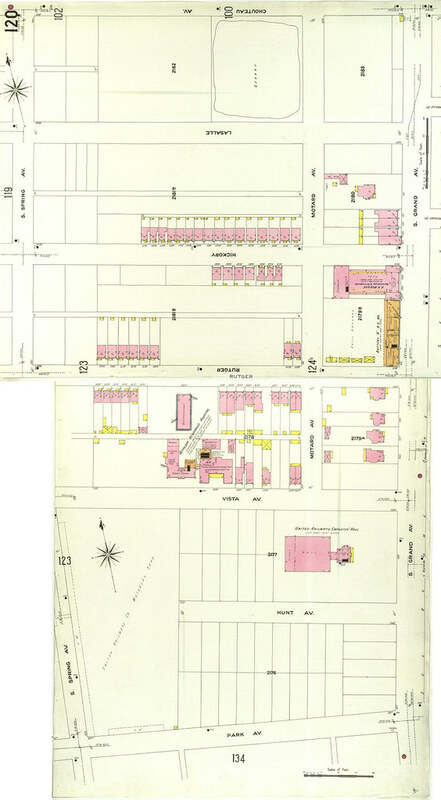 My great and great great grandparents (& their children) lived on the 3700 blocks of Hickory & Rutgers at the turn of the previous century (which is all now parking lots). Fun fact: they owned a saloon (NOT a "bar", per my grandmother--I think a saloon served food too)nearby that backed up to a professional baseball field. The players would walk across the outfield after the game to go there. I think it's in the spot where there's now a trucking company. Rally this Wednesday Evening to SAVE OUR SAUCER!